I just finished this 16" x 20" bridal bouquet which featured long stem and sweetheart roses, calla lily and astilbe. The long stems were wrapped in ribbon and adorned with a bow. 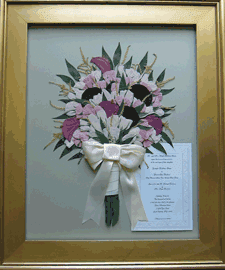 This bridal bouquet preservation was received from a referral from Don's Own Flower Shop in Geneva, NY.